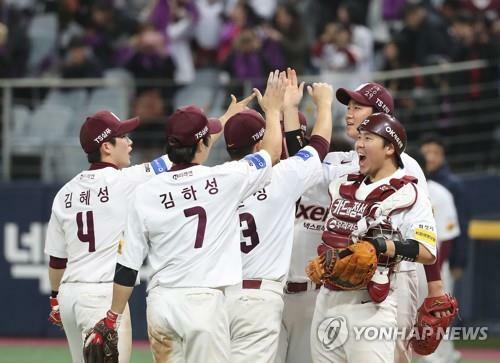 SEOUL, Oct. 23 (Yonhap) — The Nexen Heroes knocked the Hanwha Eagles out of the Korea Baseball Organization (KBO) postseason at home on Tuesday, closing out their best-of-five first-round series in four games. 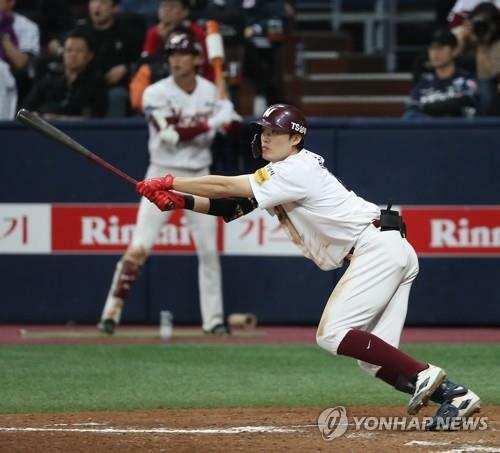 Backup outfielder Kim Kyu-min hit a go-ahead, two-run single in the fourth, and Lim Byeong-wuk — the Game 2 hero after hitting a pair of three-run homers — knocked in two insurance runs with a triple in the eighth, as the Heroes beat the Eagles 5-2 in Game 4 at Gocheok Sky Dome in Seoul. Rookie right-hander An Woo-jin tossed 5 2/3 shutout innings in relief to earn his second victory of the series. The Heroes are moving on to the next round, where the SK Wyverns, who had the second-best regular season record, are waiting. The new best-of-five series will begin Saturday at the Wyverns’ home, SK Happy Dream Park in Incheon, 40 kilometers west of Seoul. Lim was voted the MVP of the series, after going 4-for-11 with two home runs, eight RBIs and five runs scored. The Eagles scored the first run for the third straight game, capitalizing on shaky control by the 19-year-old starter Lee Seung-ho. Leadoff Jeong Keun-woo laced a double to right field on the first pitch from Lee, who walked two of the next three batters to load the bases. Lee Sung-yul hit a sacrifice fly to right to give the Eagles a 1-0 lead, though they certainly would have liked a few more runs against a pitcher who only threw 10 of his 25 first-inning pitches for strikes. The Heroes tied the score at 1-1 in the bottom third, without the benefit of a hit. Lim Byeong-wuk drew a leadoff walk, and he advanced to third when Park Ju-hong airmailed a throw to first trying to check Lim. The ball bounced off the wall near the first base dugout, and Lim reached third with ease. On the very next pitch, Kim Jae-hyun put down a perfect squeeze bunt — rolling it into the hole between the mound and the third baseman — to bring Lim home and tie the score at 1-1. The Eagles went out in front by 2-1 in the top fourth, thanks to Kim Hea-sung’s RBI groundout with men at second and third. Two straight singles to open the inning put runners at the corners for the Eagles. Choi Jae-hoon’s fly ball to right field wasn’t deep enough to drive in the go-ahead run from third, but Kim Hea-sung, the next batter, chopped one to shortstop to get a run across the plate. The Heroes erased that deficit in the bottom half of the fourth. Park Ju-hong, who held his opponents without a hit over the first three innings, loaded the bases after a walk, a single and a hit-by-pitch. With two outs, No. 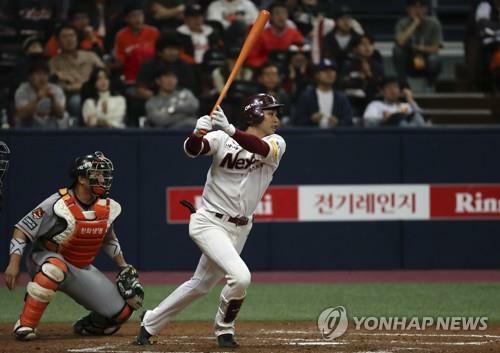 8 hitter Kim Kyu-min — in the starting lineup in left field following a season-ending injury to All-Star Lee Jung-hoo — bounced a single up the middle to knock in two runs, putting the Heroes up 3-2. The teams traded zeroes over the next three innings, and the Heroes finally broke through with two crucial runs in the bottom eighth. They got a walk and a single off new Hanwha pitcher Park Sang-won, who was pulled without recording an out. The next pitcher, Kim Beom-su, got two quick outs after a sacrifice bunt and a groundout. But Lim Byeong-wuk played the hero again, cashing in two runs with a triple to the left-center gap. And that was more than enough run support for An Woo-jin, who had entered the game with one out in the fourth and shut down the Eagles over 5 2/3 gutsy innings. The Eagles showed some life in the top of the ninth, as pinch hitter Kang Kyung-hak opened the frame with a double. But An retired the next three batters in order to clinch the game and the series. The winning manager Jang Jung-suk said that even though his team will be the underdog against the Wyverns, there will be no stopping the Heroes now. This was the Eagles’ first postseason appearance since 2007. They had home field advantage after finishing in third place in the regular season, one spot ahead of the Heroes. But the Eagles lost the first two games of the series at home last week and never recovered from the hole.